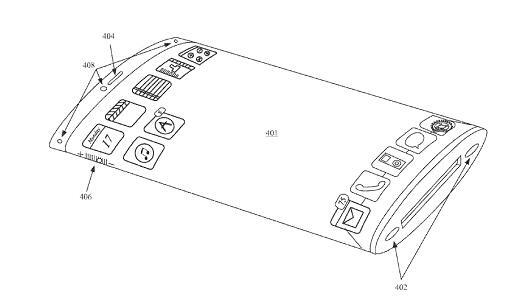 Is Apple making an iPhone with a wrap-around screen? In the filing, Apple said that the screen would remain flexible to form a “continuous loop such that images (still or video) can be presented in a wrap-around manner in which the images appear to be presented in a continuous loop.” In short, the patent details a desire to use the entire device — or as much of it as possible — as precious screen real estate. While the patent clearly states the sides won’t be used, it does open up a significant amount of screen real estate by going fully edge-to-edge, a la the Galaxy Edge. It could even lead to larger screen sizes, suggesting Apple may have plans that will exceed the 5.5-inch display of the iPhone 6s Plus. Of course, Apple wouldn’t be able to pull this off with its existing screen technology. LCD screens are stiff and rigid. It is, however, possible with the long-awaited OLED screens iPhone fans have been clamoring for. But then again, it’s just a patent, so there’s a better than zero chance it’ll never actually extend beyond the piece of paper it’s doodled on. We can hope.